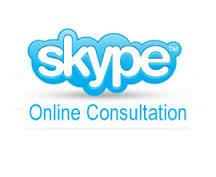 We offer skincare consultations via Skype and Facetime for clients who are unable to travel to us in person. This virtual face to face consultation enables us to discus and assess your skincare and aesthetic concerns. This can be advantageous if you have spent good money on cosmetic skincare and not seen any improvements – we can deliver your personalised skincare regime and adjust the products as your skincare requirements change.